On the final episode of Greg Faxon's Bravery Project, Charlie Gilkey, founder and CEO of Productive Flourishing, talks about why you shouldn’t bother proving the “haters” wrong, the biggest lie you tell yourself about the content you create, and how generosity is our natural state. Greg: Welcome to The Bravery Project. Today I'm talking to Charlie Gilkey. Charlie is an author and a speaker. He's a business advisor and he's also the founder of a website called Productive Flourishing, which I found early on my business journey and was really helpful so I was excited to meet him at a seminar I went to recently and the easiest way I think to describe what Charlie does is just to say that he helps people finish the stuff that matters. So Charlie thanks for being here I appreciate it. Charlie: Thanks so much for having me today Greg I'm pumped to be here. Charlie: Doing something even though it scares you to do it. Greg: So tell me more. Charlie: Well I think one of the most pernicious things that people hear is like get over your fears. Look you never get over your fears. Right, there are always going to be with you but what we learn to do is to work with and through the fear and also to learn how that fear really informs us about the you know stuff that matters to us. Because, you know, like let's take it this way Greg. Let's take some random shirt that you happen to be wearing and it happens a tear you get something and it was like just a random shirt you don't care you replace the shirt there's no emotion tied to that particular shirt. However, if it's your favorite shirt and that shirt rips then it's a big deal. You get what I'm saying. Greg: The thing is that the things we value most. Charlie: It’s the things we value most in the things that build up the most intense emotion for us that tell us what matters to us. And so really a lot of times fear tells us we were about to do something that challenges something that we hold dear. That's good information there but also what we do is we assume that because we're afraid of something that it's information telling us we shouldn't do it, right? And that's often not true so the reason I like to talk about bravery in th sense of like doing something even though you're afraid of it is because there's no sense in saying like get over your fears and just do it. You get through those. But you also pay attention to what their fear is telling you because you can be very, very useful information. Greg: So Charlie tell me a little bit about your story right where were some points in your story as an entrepreneur where you were kind of feeling the fear and you had to lean into it. Charlie: Wow. I experienced more fear before being an entrepreneur than I ever really have being an entrepreneur. And that comes from both my military experience and just some crazy things that I did as is a youth and Boy Scouts and things like that so I learned very early how to work through fear and like, you know, if you're doing something as simple as a repelling off the side of a mountain like you look over the edge of the mountain like holy crap I'm not doing this. But you check your gear you check your knots you check your training and you jump, you know. And so I had a lot of really formative experiences with those and then like a lot of times when I'm going through something in the business I say like “it's like not like I'm getting shot at” or “it's not like I'm about to fall off the side of a cliff.” Right? I mean and it helps me keep things in perspective. But you know I think I'll answer some specific questions like right now I'm doing a blogging project called “a month of no hiding”. And this also came up a bit from the seminar that we attended, because I realized that I was kind of hiding under the in the science and tech of blogging and all the random B.S. that you get into checking stats and headlines and viral priming and all that stuff that you know how to do. But you also know like come on, like, standup right? And so that's been really. I've had some fear and some some really gorilla fears because it's like I don't have an editorial calendar I have no idea what I'm going to write today. I have no idea of what I write is actually any good. Right? Just putting it out there and driving on right and so you're like so what it's a blog. Well when you've been doing this for a while and you have like you know one of the top websites in productivity and planning and people actually read it, it's really scary to be like you know what I have no freaking idea what I'm doing. I'm just showing up and put it out there. So you know that's a thing that every time I go through a product launch of my own I have those senses of fear coming out because you know you put in a lot of hard work and you never know how it's going to pay out. Right? You never know did I just waste 5K on this you know on all the developments product I'm never going to get it back or did I completely misunderstand what my what my people needed from me and not make something for them or am I going to put it out there people don't like it. Right. So you know that happens about every time I go for a launch and I'm you know I get I buy a product that’s going to be hitting, hitting the shelves here just a little one but I still feel I'm like seriously it's this little project. It's always there you know always there. And I think it's just, like I said earlier, like you learn. You learn with entrepreneurship and let's extend it past create and past entrepreneurship and talk about just living the creative life. You learn that there is just the sometimes the best places that you can be is to have that low level of creative doubt to yourself that makes you like push or edge that little a little bit more would I get worried about is when people don't have that creative doubt because then they start phoning it in. Myself as well. To be clear I'm putting myself in there I know when I'm when I'm phoning it in again that's why I'm doing this project. I you know people ask me about the month to no hiding project I'm not trying to hijack the conversation here but it's what we're talking about. And I'd like to know “Seriously Charlie what are you going to do with this like is our launch coming up?” I'm like I don't know. I don't know if I'm going to do this for months and then decide I don't want to do it I don't know if I'm going to love it. I don't know what really is going to happen when people know you as a business strategist. They don't want to accept that answer you know like I really don't. But that's the fun thing about it is I don't know. Greg: So is that, is the scary part of not having the plan not having it all planned out or is it something else? Charlie: That's a bit of it. A bit of it is and this goes to brand promises and things like that right. People expect you to have an idea of what's going on when you're in my position. Right. And just being like I don't know what's going on and having what’s that word not that you're being rejected but that people don't believe it you know? So that's part of it. And then there's just the funny thing about it is anytime you do any project in the world it displaces a whole slew of other things you could have done. And so there's always when we're time cramped and when we have just a production schedule and things like that going there's always this risk that what you're doing now is going to displace something else that was going to be more important. So...But given that I have no goal set up for this really besides publishing daily and that's about it. It really helps ease you know the little fears of wasted time and fears of like what the hell am I going to do next and how am I going to make this all make sense and all those types of things that you get into like when you're a strategist and so I don't know if that's if that's explaining anything or pulling it pulling people on inside but just really what I've told other clients in the past and this is this is really some people...OK. What I've told people in the past and it's true for all of us is the very hardest thing you do is just stand up and be seen sometimes you know, and to be that transparent about things and not know what's going on and say you know what I've got something to say. And here it is. And do that repeatedly and do that repeatedly and do it again without having the cloak of you know strategy without having a cloak of a plan without having a cloak of some sense of where this is going? You know that's just really one of those things that that's really fun about this project but that's also like what had kept me from doing it for a while was like you know what am I going to do with it I don't know what you know. Where is he going to go I don't know? And so it's kind of like one of those things like you know I've got a book coming out in June and that's not the product I was talking about but I got a book coming out sometime in June and so like I think we have to always be expanding our comfort zone with things like this not you know getting out of our comfort zone because you never do that either. Right but expanding the comfort zone to be like you know what this is that same thing that I felt back in April and it was OK then this is the same thing that I felt back in January and it was OK then it's the same thing that I felt back in 2008 and seven and six when I started all of the stuff right. It's just stays with you man. Greg: When does that fear come up for you in the course of a project? Just for me I was just released this little free guide right and when I was writing it was it wasn't scary it was like a generous thing it's like I'm writing this guide, it's just for me. Right it's for me in part just to prepare me for the fear of writing a bigger book. It's because I want to put these thoughts out into the world. And it was just it was just this generous thing. And then as I was about to you know release it was like almost a selfishness came in like OK are people going to like it because I put a lot of work into this so they better like it. Right and there was some shift some curious for you. When does the fear come in or is that just kind of a low level throughout the project. Charlie: I've learned to anticipate and project so that fear of shipping that you just mentioned right I know that when I start a project I'm going to get there. That being said it does heighten around ship day. Right it's like OK now this thing that I thought was really cool is going to be seen by other people. Is it really that cool? Or you know and this is the it sounds like one of those celebrity problems I don't have a lot of those but one of those things is like when at a certain point when you put something out it's like what is Seth going to think? What is Pam going to think what is you know what is Merlyn going to think like what are these people that you care about like they actually care like they're really invested in reading everything that you do and making sure to give you provide you commentary. Right that's not the way it works but that's that's the fear that comes up is like “what if I say what if I don't live up to expectations?” What if I don’t? What if I write something and like you know the people who believe in me are embarrassed about what I've created. Right? Those types of things come up as you get closer and because you can see it like as soon as you start to let that thing go it's like “oh no I really got to let it go.” I really gotta let this thing go. And I think that's that's where the fear is the most intense at that point. Greg: Do you have any strategies...because you've done it a few times at a bunch of times now for dealing with that fear of shipping. Charlie: Yeah. One strategy is to bring people into the process earlier so you know I just mentioned Pam that’s Pam friend a sister friend teacher coach, we do a lot of stuff together. Right. And so if I'm already like a like I'm concerned about what she thinks. Well I can bring her in earlier into the project and get feedback before I let it go. Right. And so that's one thing you can pull the people in that you most want to celebrate with you. Right. The other thing that I just mentioned and without really thinking about it the biggest frame is to accept and really feel that the people who most care about you that you most want to serve are waiting for you to give this thing to them. It's not like you're interrupting them it's not like you're like throwing it at them it's not like you're you know all up in their face with it but like if you really get centered and you're coming from a place of creative service and you're creating stuff for people. They’re waiting for you to do that. Right. That activates you know a leader sort of pack animal part of me right where it's like one thing if it's Greg if it’s just me on my own...I'm worthless as a creative. I really am because I won't do anything I know it. It's not fun for me to think about but if I know you're waiting on me it changes the whole thing. Right. It changes the whole thing for me. So it's getting the mindset that the people who you're most wanting to serve are waiting on you to do that. And not in a bad way like hair the hell up but just like no really I would really like to receive that this morning. That's a gift. I think after that it is public accountability can be really useful for things you say you’re going to ship something by April 15th. Well you look more stupid, you look, you're more embarrassed by not shipping something on April 15th then if you just are like...uh I'll work on it for another week or two and you know what I'm saying Greg is really easy to work on stuff for another week or two right? Charlie: A week or two becomes a month and a month becomes a quarter all of a sudden you haven't shipped. Greg: You know so one of the things that I'm hearing which I think is really important is to get outside of yourself as early as possible. Right, now could be a deadline that could be the book cover right that could be sharing it with your mentors and coaches. But I think that it's...It's a little bit counterintuitive to get out before it's ready and if you do, coincidentally it happens to be a great business strategy. Right, because now you co-created it and you have some buy in in anticipation. But I think it's really counterintuitive for people not just on a project level but on like a business level. Right like I say you come up with the best idea in my head and then hope that it works when I ship it well you should be scared because you have no validation externally about whether it's going to work and you just invested thousands of dollars into it as opposed to right doing some market research or putting little mini versions out there so you can get some feedback. Charlie: Yeah man that's really the way to go is when I talk about rapid prototyping from either business or creative perspective. Think about how easy this is in the world or how simple this is in the world...simple is not easy. You saw me slip up there but simple is not easy but you can put out a Facebook post people like that Facebook post you write out a blog post to people like that blog post you turn that into a small e-book people like that small eBook you turn that small eBook into a webinar that people attend to and they really like that webinar, you turn that women are into a bigger sort of Kindle book and they're like that right you can grow by creative accretion these types of things and get validation along the way. Where we fail I believe is when we hold on to that idea until it's the book the big final project on the end and then we're shipping it out there because then we get like years of our own stuff in the way as opposed to saying “hey I like that idea there” or someone saying “Hey I like that idea there and I like how you put it together.” Oh validation, you begin to get validation. Oh more people like it, oh I need to add this and so by the time you get out there you already know it works. You already know what people want and you’ve just been doing it along the way and if this pulls this pulls us into a place to where we can have a daily prolificness you know because you're just always creating something that's where I try to stay like the most and is like...you know, people have asked me when I'm writing a big book and by that I mean a big traditional like the 218 page book. And I'm like “I don't know.” I really don't. I don't particularly want to read a lot of those books. People have told me that they don't particular want to read them so I don't know why I would want to make it right now. But I'm constantly writing books. You know I'm constantly right working these ideas and oh I've got little buckets were like this this blog post could go there this this interview that I'm doing with Greg, there are pieces of that that can go into the book I'm always creating something that way. And I think in this world of hyper creativity and fast deadlines and a new way of publish or perish showing up you've got to kind of accept that mindset. And you know going back to Seth’s we sort of jumped around a few times like dude is going to write a book or two a year we know that right. And that's been a very good strategy for him or not good strategy I don't want to call it that way. That's been a very good way of him being in the world. Seth Godin if you're listening and you don't know who Seth Godin is go go to the blog subscribe. You'll have a great time. So the thing about it is when you start this prototyping thing earlier it really does help assuage all of these different fears that might come up. Greg: Fear of failure is huge for people right. So if you're going to fear failure fear the fact that you failed to validate it ahead of time. Right. Fear any type of failure, fear the failure of the failures you had earlier on when you didn't get out into the world. Because there is I mean there it's a valid fear right of failing with something that's never proven. There is a reason we have those fears right because the higher and higher you're putting pressure on yourself to get it right based on no external evidence? You know, the more the more risky it is and so I think the idea with bravery is one of things that you're saying is bravery isn't about doing the riskiest thing. It's about mitigating your risk in order to do things that other people see as scary. Charlie: Yeah it's mitigating the risk like. So when we look at. OK so this is going to be the philosopher bit so hold on with me homie Greg. I hope this is going to be worth it. There's...bravery is the, is the mean between cowardice and brashness right? So bravery is in that sweet spot that moderate spot right in this is just aristotelian ethics here right now. I'm not recommending brashness like just throw everything out there and jump off you know jump out of the airplane before you built a parachute I really don't think that that's useful for a lot of people some people have that in their DNA and in their personality. Fine if that's you jump out a plane without the parachute that’s fantastic. Many people don't have that and that's OK. So what we're looking for is saying OK we're not going to be cowards here we're not going to always hide. And by the way perfectionism is one of the best ways. It's one of the most guerrilla ways that fear comes up right and causes us to be cowards because what we tell ourselves is got to be perfect before we put it out because what we tell ourselves is the product that we make is a reflection of our value as people. And if the product isn't good we're not good. That's not true right. You can make a really crappy product and be a really good person and you could be make a fantastic product and be a crappy person right. Separate the difference between your own self-worth and what you create and you can start to pull down the walls of perfectionism which is really a fear of rejection. When you when you when you peel back all of the different layers. So bravery when it comes to work like that is really understanding that that fear is there and addressing it head on. I'm afraid that this is not going to be good. Well how do you make it good? You bring in other people and the people that you most want to bring in KNOW THAT YOU'RE A GOOD PERSON THEY know that you're smart they know that you're caring and they already know all these things. So I'm going to pause here right because there's a lot of times where we get stuck in this mindset where we're trying to prove our naysayers wrong right. All those different naysayers and it could be your third grade teacher it could be that one bully it could be that girl that laughed at you and wherever it is like we have these naysayers that come around with this and we're always trying to prove them wrong. Screw that prove your yay sayers right. Right. Prove all those people that believe in you all those people that know you got them that you got the special sauce. All those people that are just waiting on you to shine. Prove them right. Screw the naysayers, they’ve got a job of being a naysayer. That's what they do right. Never going to make them happy you're not going to prove them wrong. Spend your time proving your yay sayers is right. And that's where when we get into bravery...and I know it might sound very I don't know how all this is tying together from your side Greg but it's really one of those things where when you spend your time proving your yes sayers right you really don't need to be all that brave. Greg: I love it. So what I want to turn back to you now because I love, that's really, really helpful getting the conceptual piece. What scares you right Charlie Gilkey What scares you most? Charlie: That's a good question. Let me find the honest answer. From a professional perspective it would be wasting people's time and attention I believe. Right, time and attention are really special and I mentioned earlier. We all got stuff to do and if someone's listening to this you know interview and they're like well that was a dud. You know what I just kind of took 30 minutes of their life right. They could have done something I started however long this turns out. So I'm really sensitive about that. Right. And so that's one of my fears and I guess the other thing and this is a deep core thing is making people feel what's the word not included in the conversation not included like they don't matter. Right. They cannot fit into the conversation this might not be relevant to them. But you know if they feel like you know I don't matter like I never want someone to feel that way from my work or from me being around them. And so that's really what I look at when and when I get scared I'm like OK when it comes to my own work is this wasting someone's time in attention because I could've done something else and did someone really see this and felt like they weren't a part they were in community with us as you know I called my people Creative Giants right. I never want to Creative Giant to feel that they're not a part of the community. And here's the funny thing. I know that it's a fear I know you know how irrational it is and I know that I don't get to make anybody feel anything people feel their own things right. But it's still one of the things that I get really, really concerned about. But again for me it's all about perspective. I'm not getting shot at I'm not jumping off the side of a cliff there's no physical harm there's, there's you know. So I don't have those types of fears and you know what like if productive flourishing of my business fail tomorrow I do something else. Right. I've done that several times and not afraid of that. Greg: What I love about that is the things that you're scared of are not what people get scared of in the initial phases of “will this work? Will I go broke?” right people who are maybe making the transition to entrepreneurship because we didn't say as I'm scared of running out of money. Right you said I'm scared of wasting time and attention. And he didn't even say I'm scared of wasting their money. Right. I don't know that's a fear for you or not but it more revolved around like what is the feeling that I want my audience to feel. And what are the feelings that I really hope that they never feel because I'm here to take care of them. And that mindset is a high achieving mindset. I think I mean I think that that mindset leads you to create better stuff. And as long as you realize it's not rational and you can be OK with, you know, risking that it's going to happen. I love that way of reframing the fear. Charlie: Yeah so you know that's when that's really one of the fears behind like the project that I mentioned earlier is like I could really be wasting people's time you know. But the way I set it up I set up rules to two I know myself I know myself really, really well and so that's part of it right. The whole philosophical Socratic like know thyself, right, we've been saying that for millennia and there's a very good reason why we say that by the way that's not just in the Western tradition that's an Eastern tradition as well with Sun Tzu and so forth but. But a set of rules I'm like look I'm going to be publishing daily I don't know what's going to happen if you want to follow this along here you go. So like if someone like doesn't want to follow along OK. Like I kind of gave them the option like you don't have to go on this journey that could be a complete waste of time. Right. With me. Charlie: Yeah. Yeah. Permission and invitation is where I would want to switch so much of the marketing and sales stuff that goes out there which scares a lot of people especially in the early stage of entrepreneurship because when we think about permission and invitation as opposed to...Projection and persuasion in a different way. Right not persuasion manipulation as I'll use your word when we think that sales and marketing are projection and manipulation we can feel really awkward. However when marketing and sales becomes permission and an invitation it changes things. I could say “Greg like you know this has been a fantastic conversation” or if we met you know somewhere off line and we're having a really good sort of you know business conversation or just a conversation and you wanted to continue to have those conversations with me as an advisor. I'd say “you know what Greg's been really fun talking to you. 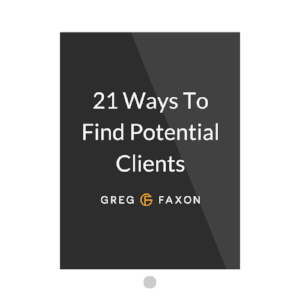 I've enjoyed helping you, if you would like at any point to work with me, I would love that and here's how you can do that.” I could walk away from that point right? Greg: And you’re not attached to the outcome, and people can sense it. Charlie: Right. Yeah And now they're like oh well you know that must be nice because like I mean earlier like you know someone listening who might be an earlier stage version of that must be nice to be able to walk away but I got to feed myself right. I totally get that like I have...Sorry about that hit my mic. I have I have the same thing I've got a roof over my head. Right I'm going to pay for things like that but I think it's just you know what like showing up and getting people's permission and invitation to serve them and being generous and then following through with that. It's going to pay for itself it always does. Right. And you can call that a strategy if you want to like a business strategy or you can just call it like the way of humans right the way we all have always been together is we build these little communities of people who have interdependent needs. And you know interdependent goals and to do so generously and then you look at thriving communities is always is very, very high level of generosity and interdependence. And we are each responsible and have the capabilities of creating those relationships with those around us we don't need someone else to pick us to do that we can just do that. I know I went on a side rant about human networks. Greg: One of the things that he said early on was someone who earlier in their entrepreneurial journey might feel the need to manipulate more luck. I got to do it fast I just gotta get it like it doesn't feel comfortable but I feel like I have to do it this way and I can't be kind of the cool cucumber like you know I don't need it and feel not attached. Actually I'm skeptical of that. I think you can, you know, because I remember a shift where I went from needy to not not attached at all to the outcome and it didn't have to do with money. Early on in my business it was really because I realized...Number one I wanted to be in line with who I am and my values. But number two it actually will be more effective this way. And so I think that that's important for people to get because you're right it is a common fear of coming off of salesy or pushy or you know all this stuff when you're starting off your business and it makes sense that people would feel that way because you know no one really wants to be that guy in their business. Charlie: Yeah no one wants to be that guy. And you know if you're really interested in this conversation I would highly recommend Dan Pink's To Sell is Human. It's a book that he published, a good book on this. Right but. Here's what happens here. Here's the cycle that happens at for an early stage entrepreneur in the business now. If you're interested at all this early stage stuff you've actually written a book called The Small Business Life Cycle that discusses the different stages of small business growth and there's you know stuff on my website about it too that you can check out. But the cycle becomes people are really scared, nervous, anxious, desperate to get paid. We try to bottle that up. Mask it and talk to people. But we're really, really good as people at sensing that. So we end up pushing them away a little bit because there is this weird energy. The person who is then desperate and the pursuer gets even more awkward and pushes more and pushes more right and it doesn't want to show up because it's like oh man I need to send this email again but I don't know if it's going to work in or whoa I gotta get on this call and talk to this person and it's not going well and we tell that we build up all of this thing right. When you approach it from a place of generosity and permission and invitation it's like your blessing to get to write to this person and talk to him like “ah man I got to talk to Greg I need to send this email. I want to send him something along the way.” Right and you can show up with a completely different energy and it makes a difference. It just really makes a huge difference for the person that's the pursuer because the pursuer becomes the server. Think about it the pursuer becomes the server and the person being pursued becomes the person being served. Charlie: So we do know we're going to talk about sales today but there we go. Greg: I mean it's really at the core I think that a lot of people realize that sales is, a lot of people who succeed as entrepreneurs start off as great salespeople. So you wrote an article. You know when I first came across the work for even that called “the 50 plus better questions to ask them how to be more productive.” And I always like to leave people who are listening to the interviews kind of like you know what actions that are one takeaway right at the end and I think everyone listening has the question how do I be more productive. So if you had to choose one better question to ask in how to be more productive. So if you had to choose one better question than how to be more productive what would that be? Greg: And what shifts to ask that questions. Charlie: Well. It focuses on two things focuses on the things that matter to you actually the priorities and shifted away from what will I get done to what do I need to do and I know those seem to be subtle shifts but you know I don't it's hard to say sometimes when you're going to finish something right but I think we can all sleep at night when we know that we really sleep well at night when we really showed up and took action on the stuff that mattered to us, now, stuff. It could be your relationship with your partner. It can be your backyard project it can be this creative project and to be a business partner I don't care what stuff it is right. If it matters to you my chief question is “what you are doing day to day to take action on that to pursue or to cultivate it and to get where you're trying to go with that?” If he showed up and you really showed up and you got away from all the distractions all the different ways in which he might hide with the project ways you know you might make it this way and that way it just really took focused action on it that was the best you had today and you did that every day you'd be just blown away by what you can get done. So that's why I would start with that question what matters to you today and what are you doing to take action on it. Greg: I love it thanks Charlie. Charlie: Thanks so much for having me. Greg: Alright, we’ll talk soon brother. Bye.